Remember, the Saudi Interior Ministry claimed that it executed 47 terrorists. To all appearances, these people were the same as those running amok in Syria. But what made them terrorists in Saudi Arabia? Being protesters demonstrating against the Wahhabi Saudi royal family led by Shia religious leader Nimr Al Nimr. Furthermore, this same terrorist regime in Saudi Arabia is funding the fighters in Syria to destabilize the country and topple its democratically elected President. This same Saudi regime is launching a war of genocide against Yemen so that it may impose a proxy leader on the Yemeni people. Turkey's latest scandal regarding freedom of speech and democracy surrounds the recent government takeover of Zaman Daily News in order to silence journalists who are critical of Erdogan. However, this same empire of the new Ottoman Erdogan is the first station for every terrorist to cross when trying to entire Syria. Once they arrive, of course, the West considers them freedom fighters. S, ISIL, or their black flag. It is about those who created the boogeyman to begin with - sometimes as moderate rebels, other times wearing the mask of ISIS. 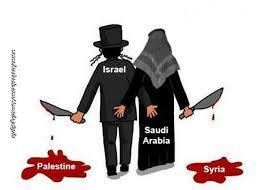 The real source of those terrorists is not some dark hole in the desert, it is Saudi Arabia, Turkey, Qatar, and Israel.